Wanna get roped into a fun story from the golden age of stories? Read on and I’ll tell you about a fun collection of stories that will be released this coming June from Galaxy Audio and Galaxy Press. Galaxy Press and the audio book equivalent Galaxy Audio have been releasing the stories from the Golden Age, other wise known as the days of pulp fiction, since 2008. During the early to mid 20th century in America there were all sorts of cheaply printed magazines that specialized in everything from sci-fi, mysteries, crime-stories to westerns. The magazines were printed on cheap paper that was so cheap that the pulp was clearly seen and felt, thus the name Pulp Fiction. Many writers used these magazines as outlets to release some of the greatest stories ever written. During this time L. Ron Hubbard was prolific at putting out the stories and he would write in every genre of fiction that was printed in these magazines. Galaxy Press has been re-releasing these stories creating a newer version of the pulps. These books contain stories written by Hubbard in these magazines and picking up these books you can escape back in time and enjoy some fun short stories from the master storyteller. Galaxy Audio is the audiobook side of Galaxy Press and they release the books in audio form that still create that feel of the pulps. The audiobooks sound like an old-time radio drama from those same days. With the over the top Hubbard characters, the actors bring to life the written word with some great vocal acting. The music is created for each genre and really push the emotions and excitement of the stories. One other thing, being like an old-time radio drama they have sound effects that not only perfectly match the events and ambiance of the story settings but keep the story in your head so you can still create your own theatrical performance. This time around I listened to another group of stories from the Western genre. This is a genre that I never had even thought of reading, let alone listen to in audiobook form. I was just never a Western fan. With the excellent productions I had heard from Galaxy Audio in the Sci-Fi stories from L. Ron Hubbard, I ventured into some of the Fantasy, Mystery and Adventure stories and finally broke down and gave the Westerns a chance. I was not at all surprised at the production being just as superb but I was surprised that I now look forward to listening to another Hubbard Western story. The two aspects that sold me are the excellent vocal skills of all the actors and the realistic but subtle sound effects, even the rattlesnakes sound like they can strike if you get to close to the speakers. This book, which once again will be released in June of 2012, contains 3 stories from the Western Pulp Fiction magazines. “The Toughest Ranger,” originally published in the June, 1938 issue of “Western Story Magazine,” tells the story of a scared, exhausted, and half-starved young Petey McGuire, a saddle tramp on the run from one beating to another, crying sensitively when a lame horse has to be shot. He finally gets angry or maybe hungry enough to become the toughest Ranger. Petey finds his way to the headquarters of the Arizona Rangers looking for a job. Needing food for himself and his horse, Petey creates a new ornery personality; he claims to be the toughest man around from Kansas City to Nawlins (New Orleans for you city folk), a man so tough he’d give a rattler nightmares. 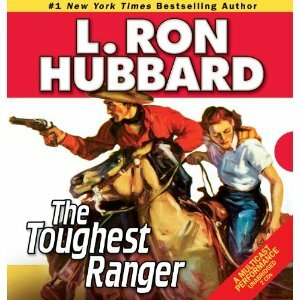 But when the chief Ranger, Captain Shannon, calls Petey’s bluff and sends him after the most dangerous desperado in the state, Petey must discover what it really means to be Ranger-tough. The second story, “The Ranch That No One Would Buy,” originally published in the October, 1939 issue of “Western Yarns,” tells the tale of when a fearful young man comes to town to buy a ranch for a friend and is challenged to a gun fight for cheating by the local bully. The outcome of the six-gun showdown seems sadly predictable. But this is an L. Ron Hubbard book and one of the things he’s best at is throwing twists and turns into a story, and the ending may surprise you a bit. “Silent Pards,” originally published in the November, 1938 issue of “Western Story Magazine” is a fun tale that tells of an old prospector, Old Cherokee, who gets his gold stolen from him twice, but when of rattlesnakes have Old Cherokee marked for their hungry fangs, they overlook his two silent partners, his dog, Hardtack, and Joe the mule. This one was the best story to close out this collection, in that it was just plain fun, and you knew the bad guys were gonna get what’s due. So venture off into some fun stories from the days of Pulp fiction and escape.